Wash the okra, dry them and cut them into 1/2-inch pieces omitting the tip and the tail ends. Heat oil in a kadai and add mustard seeds. Once they start spluttering, add red chilli and channa dal. When the dal turns golden brown, add the okra pieces. Add turmeric powder, mix well and saute on medium flame for about 5 minutes. Then reduce to low flame and let it cook for another 6-8 minutes (this reduces the sliminess of the okra pieces). Keep stirring in between so that the pieces do not stick to the bottom of the kadai or burn. Now add chilli powder and salt and mix well. Let it cook on low flame till the okra is cooked. 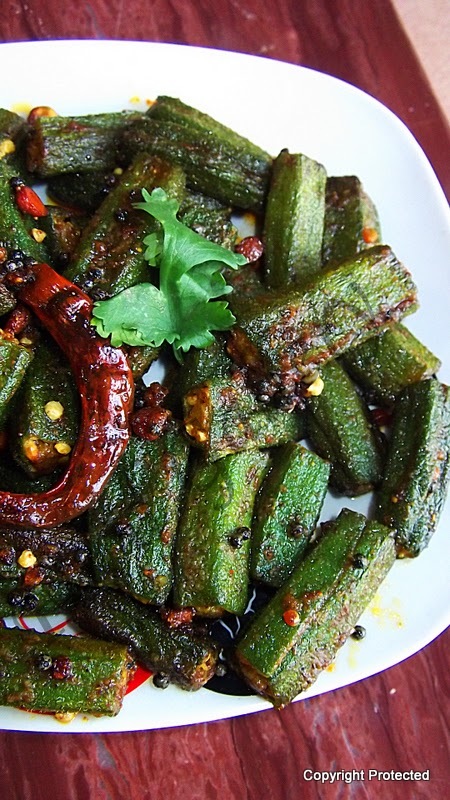 Take care not to overcook the okra. It should be a bit crunchy in texture. Now okra fry is ready to serve with plain hot rice or as a side to sambar or rasam.